Premature ventricular contractions (PVC) also known as ventricular ectopics or ectopic heart beats are a very common problem in everyday cardiology practice. Patients may be referred because they are symptomatic with palpitations often described as "skipped or missed beats" but they may also have symptoms of shortness of breath, dizziness or poor exercise capacity. Sometimes the ectopic beat is an incidental finding in a patient with no symptoms. Patients with ectopic beats may often be very anxious and concerned that there heart is going to stop or that they are going to have a heart attack. So how should ectopic beats be evaluated and managed? I like to divide the problem into a risk assessment and an evaluation of symptoms and discussion about treatment options. First it is important to establish whether the PVCs are related to an underlying cardiomyopathy or ischaemic heart disease. If neither of these are present then it is likely that the PVCs will be benign and the patient is at low risk. Establishing the frequency and origin of the PVCs is important to assess the risk of developing what is now becoming known as "abnormal activation cardiomyopathy" (AAC). In people with frequent PVCs (>10,000-20,000 per 24h or >10% of the QRS complexes) or if the PVCs originate from an epicardial source then the risk of cardiomyopathy caused by the abnormal activation is increased. These patients should be screening regularly for an reduction in left ventricle function using an echocardiography. If this occurs then consideration can be given to using medical therapy or ablation to reduce the risk of a further decline in function. The standard 12 lead ECG is a very useful guide to the origin of the PVC and there is a lot of information available if you know how to interpret the trace. For example If the PVC has a left bundle branch block morphology (a negative in lead V1) then its usually a right ventricle origin. if the PVC has a right bundle branch block morphology (positive in V1) then there is usually left ventricular origin. PVCs originating from the outflow tracts are usually of left bundle branch block morphology with an inferior axis. Determining whether they are left or right sided origin is more difficult but a recent paper has demonstrated that the ratio of the S wave in V2 to the R wave in V3 (V2S/V3R) can be useful since if it is <1.5 it accurately predicts an LV outflow tract origin. Also it is useful to determine if the PVC is endocardial or epicardial in origin. Usually if there is a QS configuration in the inferior or lateral leads in a patient without structural heart disease then the ecoptic will be epicardial in origin, if there is an R wave in these leads then it will be endocardial. If there is an epicardial source of the PVCs then there is a higher likiihood of developing a cardiomyopathy and in these patient more frequent monitoring every 6 months with an echo is required. The coupling interval between the ectopic and the normally conducted beat is also a factor to consider. 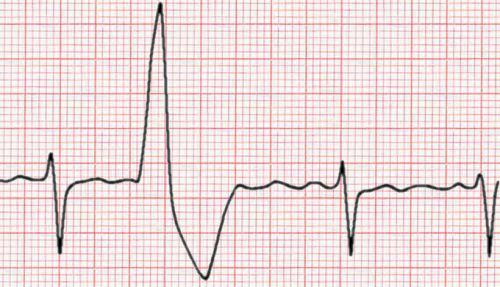 PVCs usually occur at relatively fixed coupling intervals from the preceding normal QRS complex. However in patients with PVCs originating in unusual areas such as the aortic sinuses of Valsalva and great cardiac vein the PVC coupling interval is highly variable. The coupling interval is very easily measured from the ECG and may be a useful diagnostic tool to determine the origin of idiopathic PVCs and aid in planning ablation procedure strategy. For people with a high frequency of ectopics then a trial of medication or catheter ablation may be considered. In people with LV dysfunction and frequent PVCs (>10 000–20 000 or >10% of total heart beats over 24 hours) or if the suspicion for PVC-induced cardiomyopathy is high then an ablation might be the best form of treatment. The long-term prognosis of frequent PVCs is considered to be benign and most of patients with frequent PVCs have normal LV function. The preferred treatment is usually reassurance and counseling of the patient with close follow-up if the patient is asymptomatic. For symptomatic patients lifestyle adjustment may be helpful. Advice to reduce alcohol consumption, caffeinated drinks and any foods (e.g. those containing monosodium glutamate) that they consider to increase the frequency of symptoms may be helpful for some people. In the presence of symptoms treatment with a β-blocker or a nondihydropyridine calcium channel blocker may be the first-line therapy. A randomized placebo-controlled study showed that atenolol significantly decreased symptom frequency and PVC count. Other drugs such as flecainide or sotalol may be considered when first line therapy is ineffective. 91% of patients taking flecainide and 55% of patients on mexiletine had a PVC reduction of ≥70%. When heart function is abnormal flecainide or propafenone are not recommended. Amiodarone has a very favorable cardiac safety profile and a randomized, double-blind, placebo-controlled trial conducted showed that amiodarone was significantly more effective in suppressing PVCs with concomitant improvement in LVEF in patients with congestive heart failure and asymptomatic ventricular arrhythmia.